Home » What Color Is Your Inner Red Sox Fan? What Color Is Your Inner Red Sox Fan? What color is your inner fan? Today mine is pink. Although, some days it is green or mustard yellow - or black if I'm wearing one of the Sox championship hats! As I type this post, I’m wearing my almost new Red Sox very pink t-shirt that my kids gave me for Mother’s Day, part of MLB’s Breast Cancer Awareness line. Does any of this nonteam color wearing make me somehow a "lesser fan", as some have argued recently? No way! In fact, I'd argue the exact opposite. I may not have all the player stats committed to memory but I know what’s going on with my home town boys just like the "real color" wearing fans. I just opt to have variety in my fan-womanship. 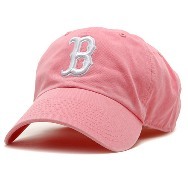 "Pink is not a part of the Red Sox palette….And while we're at it, ban the green ones and the camouflage ones, too. Those aren't the team's colors." This man goes so far to not even allow his two young daughters to wear pink hats and has banned them from his home. Yet, he fails to realize a very important fact: these hats, like the entire rainbow of Red Sox hats, didn't emerge out of thin air. I didn't create them nor did any of my pink hat wearing fellow fans. These are all Red Sox and MLB approved! Even the Red Sox wear "non team" colors on occasion to show support for important causes. They recently wore green to support the Boston Celtics championship win and they wore pink and used pink bats on Mother's Day. Different strokes for different folks is what I feel, and what sociologist Michael Ian Borer told the Globe in the article: “All fans are different, so it makes sense that not everyone worships in the same way." Our kids learn to become fans from us. How we act in any sports venues is the foundation of our kids' fan behavior. This isn’t as much about hat wearing as it is about sportsmanship and, perhaps, stereotypes. What we should be focusing on is ensuring the family fun and appropriateness at all sports venues for our kids. For professional spectator sports, there are much bigger fish to fry than wardrobe! How about adults becoming intoxicated in front of kids or smoking in the seats even though the parks are nonsmoking? How about the swearing and rowdy behavior occurring right in front of our kids who are there to see their MLB heroes? We don’t take our kids to Red Sox vs. Yankees games any more because of adult behavior out of control. We just don’t want them to witness this stuff and the last time we took them to see "the rivalry of the century", a drunken man basically fell on my daughter. We left the next inning. What we wear on our heads is not what matters. What matters is the judgment of the brain that the hat is covering! Today my inner fan is pink, tomorrow it may be green and hard to predict beyond that. I just go by the inner fan flow. By the way, any guesses what I'll be wearing on my head next time I'm at Fenway Park with my family? You got it - pink!